Barbie Girl | "Marley, stop..."
-I do my best not to purchase ‘character’ clothing for my kids. If they have on a ‘character’ piece of clothing or own a toy, it was either a gift, hand me down or on 50-70+% off clearance. I get so frustrated on the markup on character items and do my best not to contribute. -I do not typically condone or suggest ‘leashing’ your kids. Today is the first in three days that the kids have been able to play outside due to Hurricane Irene. Luckily we had minimal clean up and the large branches that fell missed our house. The temperature today is lovely and there is a nice breeze. It’s threatening to storm, but we managed to sneak in about 30 minutes of playtime. 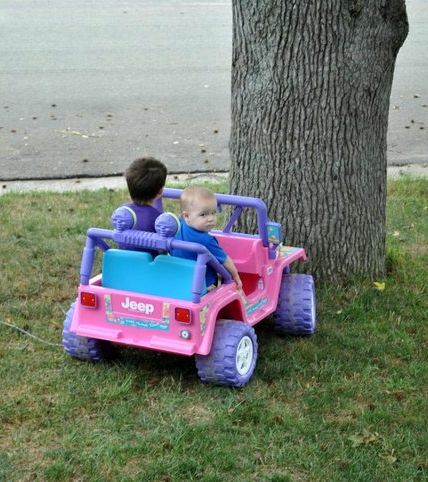 The kids wanted to play with our newly acquired Barbie Jeep. I loathe this thing. I saw it in our neighborhood for sale and thought about telling Ben, but I ‘forgot’ to (aka came to my senses). However, he walked through the door that evening cryptically whispering to me about wanting to take Marley to go try it out. I agreed. They came back an hour or so later with the Jeep and word of a new friend. (That’s another post entirely!) What Ben failed to tell Marley was that the $25 jeep didn’t come with a battery and it would be the next day before he could go buy one. That didn’t stop her or Killian from begging to go drive it. I spent the next twenty minutes pushing the blasted Jeep around the front yard and longer than that calming down the kids after dragging them out of the mosquito infested front yard and into the house. So far, the Jeep has been anything but fun. *No trees were injured in the making of this photograph/blog entry. Marley constantly steered into trees, off the curb and into the road, or way too close to our own vehicles. I finally put a piece of painter’s tape on the steering wheel and cut it to a point in a last ditch effort to help Marley understand navigating this beast. I know, I'm a genius. So, anyway– I loathe it, but the kids love it/Ben paid for it even though he doesn’t have to ‘deal’ with it. 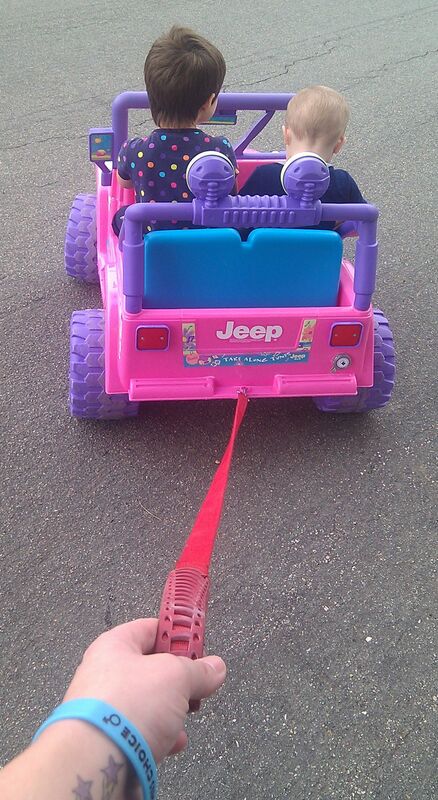 Now, like I said– I don’t condone ‘leashing’ your children, but technically I was leashing the Jeep! We headed out to go around the block and down into another part of our neighborhood. We only made it about halfway down the next street before the thunder started and it began to sprinkle. 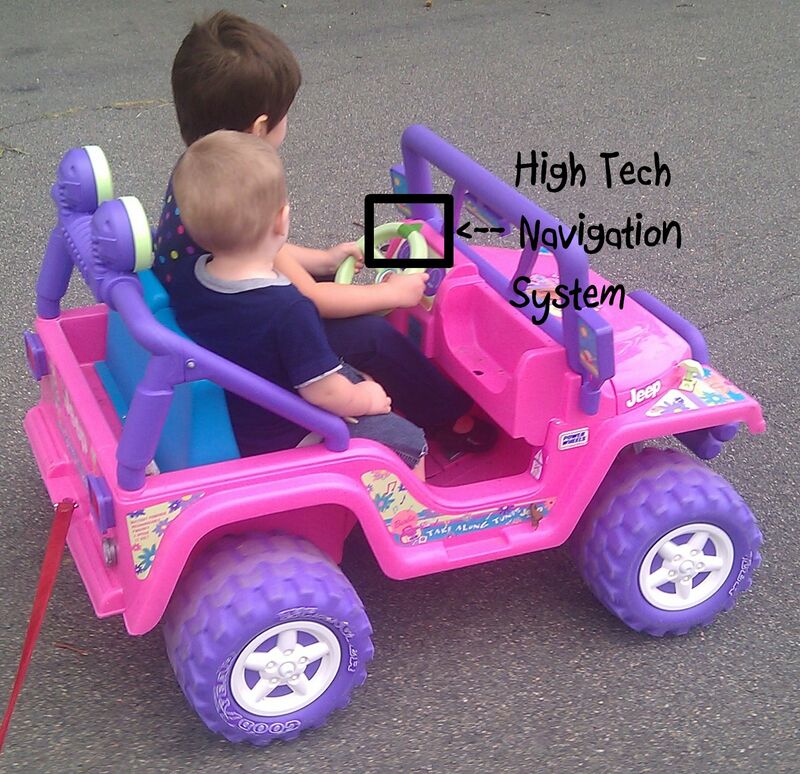 Of course, this was when Marley was FINALLY beginning to understand how to steer and drive at the same time without crashing into things (& that doing so makes turning MUCH easier). For your viewing pleasure– here’s Marley in “Park it Like it’s Hot” (a mommy-made original movie). I’m thinking that with the addition of the tether and the navigation system, ‘The Beast’ could become something really great. It keeps the kids contained on a walk, it gives Marley something to focus on so that she isn’t bored 3 minutes in, it helps me/us learn to communicate effectively with her in ways that she understands, it promotes bonding & sharing by allowing Killian to ride along/take turns, and it gets me out of the house (unless it’s hot. or raining. or muggy.). Communicating effectively has been a challenge for us– especially Ben. Marley (and kids in general ‘on the spectrum’) operates by a whole other set of rules. She sees the world differently and even being with her nearly 24/7 since her birth 4 years ago, I am still learning to adjust my expectations or rethink how I say/ask/do things to avoid a meltdown or to help her understand/execute something. Saying it louder/more sternly/with anger accomplishes nothing. Phrasing it differently (in my mind before I say it ‘wrong’ and mess up the possibility) does. Bargaining doesn’t always work. Sometimes bribing does. Bribing with gummy vitamins to get her to brush her teeth (with toothpaste for more than 3 seconds) twice a day is a win/win! It’s ok if she wears full snow gear to the grocery store if it means I get to shop. Allowing her to touch produce I’ve selected (which she is the main consumer of) is completely acceptable and she LOVES it. ‘Sizing’ (weighing) them is like a dream come true for her and allows us to talk about numbers and practice recognition. It’s ok for her to touch every.single.item. in the craft store. Twice. This does not mean it wasn’t a ‘good’ trip and yes, she can still get a small toy or lollipop at the end. It doesn’t matter what order she eats her food in, as long as she eats. Of course, it helps that the kid craves fruit. Letting her wear the same ‘comfy’ clothes for days at a time is totally fine– as long as she changes her underwear. It’s ok if she can’t spell her name/draw a square/recite her address/recognize more than 4 letters of the alphabet (M, B, X, O). She’s 4. Do you know what a 4 year old should know? Can’t that be said of many things in parenting? Each child is different, and I think that parents come to that conclusion easily enough on their own and adjust accordingly. However, when you’re parenting a child whose basic wiring is so different from your other children/your friend’s children/children you’ve babysat or see in public, the advice holds even more truth. Yes, I know that some of us knew ‘something was different’ for long before a formal diagnosis. I know that some parents that read this may have a child with a genetic condition that was diagnosed before/at birth. You may have read about it or seen it on a tv show/movie. You may have a relative/friend with it. Yes, I know your child has lived with it their whole life/months/years before you found this blog or got diagnosed. But, what I mean is that you just met this need/challenge in YOUR child you are learning TOGETHER. They haven’t lived a life with it, figured it all out or how to navigate the world comfortably and then come back as a child to start over and exhaust/test/frustrate you. They don’t have all the answers and neither do you or I, but that’s ok because the journey is so much more than the destination. Posted in Aspergers, Diagnosis, Marley!, SPD. Bookmark the permalink. I love you and your genius mind. Pingback: The Others « "Marley, stop…"